How To Bring Real Targeted USA Visitors To Your Blog? Visitors or Traffic is the lifeblood of any online community. If an ordinary guy starts a blog, who has no familiarity with blogging. But still he is pretty confident that there is just one thing which will create an enormous difference, and that is organic Traffic. In terms of traffic, there are many countries in the world which has the capabilities to make an organization worthwhile. However, do you know the one country which is matchless? Yes, your assumption is correct it’s United States of America (USA). Getting targeted US traffic from search engines to a website is considered as the most complicated task. If we study facts about the internet population side by side, we will come across the conclusion that 22.4% of internet users are Americans. As per the latest trends, it’s obvious that America is the most significant market to bring targeted traffic for all online organizations across the globe. 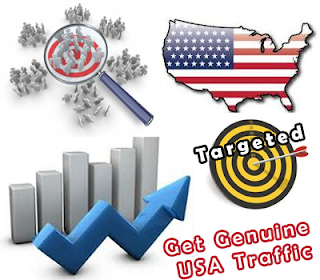 American Traffic is so essential because it brings profit along with that it attracts more potential advertisers. Therefore, they earn more money online than everyone. So today, we will discuss How to magnetize more targeted American visitors to your site? As we have already mentioned, America is the most impressive market for online communities to double their earnings. 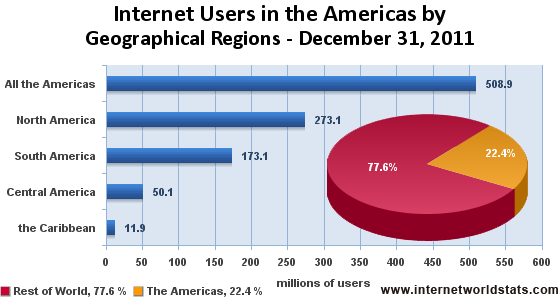 America is the only country which has the highest percentage of internet users to be exact its 22.4%, while the rest of the world has the remaining percentage of 77.6%. Following is the graphical representation of Internet users in the America. While I was searching the gigantic world of the internet, I discovered an eye-catching fact. What you think which is the finest social networking platform that increases our blog traffic? Majority of online users will suggest Facebook, but if you are targeting US traffic then Facebook will not help you in any circumstances. We all know Facebook is the most used Social networking website, which has almost millions of daily users. But statistics indicate something else StumbleUpon.com is the prime Social networking website, which brings the most USA traffic to our blog. So those who are taking StumbleUpon.com as granted should take advantage of this glorious opportunity, and should start promoting their blog or website. Well what I should say about this amazing service, it is an ideal tool developed by Google.com. Google HotTrends allow us to get access to the huge list of popular keywords, which can bring more targeted USA Traffic. This is a highly professional service which updates each and every second. This is the reason why we can use it effectively and can increase our website’s targeted traffic on our figure tips. For more pleasing results, try to publish posts related to the Hot Trends. The most successful and the easiest way to attract American audience, then we must buy a dot.us domain name. It appears pretty childish, but according to the facts it does brings bulks of US Target visitors to your blog or website. Sharing my personal experience after having a deep research, I purchased a dot.us domain name and thankfully the results were promising. I am certain it will not let you down just give it a try. The world of web directories is incredibly big. Essential web directories like Dmoz.com, Yahoo Directory has greater significance, but lacks when it comes to bring US Visitors to a blog. However, there are many other American website directories which do bring heaps of traffic with perfection. The thing which makes it less appealing, it only works with highly professional website. Therefore, this might not give small sites the most promising results but still its worth considering. There are tons of American websites with the gigantic fan following. We need to pick a website with correct niche and can fancy our chances by putting an advertisement on it. You may only prefer this method if you are in a do or die situation otherwise it’s not that much recommended. It totally depends on your selection if you choose a perfect website then no one can stop the flow of USA Traffic on your blog. To attract more genuine American visitors we must create posts about them. On this occasion, we can take help of Google Trends and can search for a more exact topic and can craft a fantastic post. However, one post will not do much we need to create multiple posts about USA to get more attention. After creating a trendy post for American visitors maintain patience, soon you will be able to see results with excellence. As always Americans have retained the top most position in the world, when it comes to information technology. Just take the example of a pioneer Google, which is also developed by an American. You cannot imagine current top 3 Pro Blogger of the world belongs to America. This shows how dedicated and hard-working they are. This is the motive why it's essential to magnetize American Traffic to your blog. We hope you have enjoyed the tips, and we guarantee these methods will surely bring lots of USA based traffic to your Blog. If you need any help feel free to ask. Till then peace, blessings and happy Blogging. The USA Free Web Directories are not working..
is reduced around 30% in last 10 days.What i did?? i removed popup adds. from my blog... now using text and image adds.